(27.09) No.1132 – Alberto Armeni (=3; Circe; Madrasi; Maximummer). Babson task. (23.09) No.1131 – Chris Feather (ser-h#25; Alphabetic Chess). The author of Fairings himself! (22.09) No.1129 – Ľuboš Kekely (h#4; White Super-Transmuting King). (20.09) No.1128 – Themis Argirakopoulos (h#2; Circe; Take&Make; Madrasi). Change of fairy conditions in the twins. (19.09) No.1127 – Andrew Buchanan (h=3; Chess4E71). Warm welcome to Andrew with the presentation of his new fairy condition Chess4E71! The Macedonian ambien Problemist (“TMP”) announces the formal tourney “TMP” League 2016 in four sections (free themes): #2 – Miodrag Mladenovi? ; #3 – Aleksandr Sygurov; s#3-7 – Živko Janevski; h#4-8 – Zlatko Mihajloski (a reserve judge for any section – Hans Gruber). Entries for any of the above tourneys should be sent by 1 October 2016: Zoran Gavrilovski, ul. “Karpoševo vostanie” br. 4 (zgrada A3), vlez 3, stan 10, MK-1020 Skopje, Macedonia (or by e-mail to mprobl@yahoo.com). The tourney brochure with the awards and the total ladder will be published in 2016 and all participants will receive the preliminary awards by e-mail. The authors of honoured problems will receive the tourney brochure by snail mail and the best-placed authors (in particular section(s) or the total ladder) will also receive some issues of “The Macedonian Problemist” as a modest magazine-prize. (18.09) No.1022.1 – Vincenzo Tinebra (#2; Circe; Antelope; Giraffe; Grasshopper; Lion; Locust; Nightrider). The original problem is related to JF-2016(I), and the version was shown in the comments before the end of that period, so, in spite of the late official publication I’ve agreed with the judge to relate the version to the old period too. Dedicated to Stephen Emmerson. (15.09) No.1126 – Valerio Agostini & Gabriele Brunori (h#2; Gnu; Black Oscillating Kings). The first time on JF the Oscillating Kings: After each move the Kings exchange their places. (14.09) No.1124, 1125 – Erich Bartel. 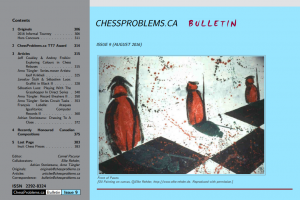 Two serial problems: No.1124 (ser-==6; Circe Chameleon; Madrasi RI; Alphabetic Chess), No.1125 (ser-s#15; Circe Equipollents; White Minimummer; Marguerite). (11.09) No.1123 – Igor Kochulov (h#3; Lion; Koeko). Super AUW. (03.09) No.1122 – Gani Ganapathi (PG 9). (03.09) No.1121 – Anatoly Stepochkin (h#2; Grasshopper; Lion). (02.09) No.1120 – Aleksey Oganesjan (hs#5). hs# Valladao of 9 pieces.